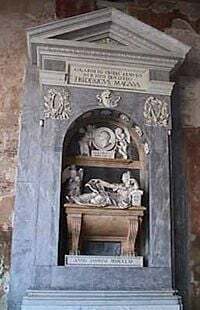 Tomb of Algarotti in Camposanto di Pisa. Count Francesco Algarotti (December 11, 1712–3 May, 1764) was an Italian philosopher and art critic. After studying at the University of Bologna, he went to Paris, where he became friendly with Voltaire. He was a connoisseur of the arts and sciences, and was respected by Enlightenment philosophers for the extent of his knowledge and his elegant presentation of advanced ideas. In 1739, he was summoned to the court of Frederick the Great, who made him a Prussian count and Court Chamberlain. Algarotti's writings include several studies on classical themes and a series of treatises on language (Sopra la necessità di scrivere nella propria lingua, 1750), opera (Saggio sopra l'opera in musica, 1755), architecture (Sopra l'architettura, 1756), Horace, (Sopra Orazio, 1760), and painting (Sopra la pittura, 1762). His essays were responsible for introducing the genre of essay-writing into Italy. His earliest work, Newtonianesimo per le dame, ovvero Dialoghi sopra la luce e i colori ("Newtonianism for Ladies, Dialogue on Light and Color”), published in 1937, helped to introduce Newtonian ideas to the European public. He also published Viaggi di Russia, a collection of imaginary letters to Lord Harvey and Scipione Maffei, evaluating the Russian political and military situation. 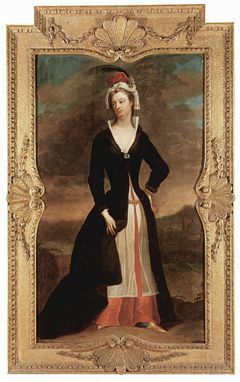 Mary Wortley Montagu, by Charles Jervas, after 1716. Francesco Algarotti was born December 11, 1712, in Venice, to a rich merchant. He studied at Rome for a year, and then studied natural sciences and mathematics at Bologna and Florence. At age of 20, he went to Paris, where he became friendly with Voltaire and, in 1737, published Newtonianesimo per le dame, ovvero Dialoghi sopra la luce e i colori ("Newtonianism for Ladies , Dialogue on Light and Color”), a popular work on Newtonian optics. His elegance and sophistication, physical attractiveness, and lively intelligence made an impression in European intellectual circles. Voltaire called him his "cher cygne de Padoue" ("dear swan of Padua"). In 1736, he went to London to further his career and attracted the attention of Lady Mary Wortley Montagu (1689 – 1762), an essayist, feminist, and author of Turkish Embassy Letters, who became infatuated with him. She proposed that they live together in Italy, and in 1739, she left her husband, saying she was traveling to the continent for reasons of health. By this time, however, Algarotti, returning from a visit to Russia, had been summoned to Berlin by Frederick II the Great. When they did meet in Turin in 1741, it proved a disagreeable experience. A member of the Royal Society, Algarotti was a cosmopolitan and eclectic writer, popular in many European courts. Frederick the Great made him a Prussian count in 1740, and Court Chamberlain in 1747. Augustus III of Poland also honored him with the title of Councillor. In 1754, after seven years' residence partly in Berlin and partly in Dresden, he returned to Italy, living in Venice and then at Pisa, where he died. Frederick the Great erected, to his memory, a monument on the Campo Santo at Pisa, inscribed “Algarottus non omnis” (“[Here lies] Algarotti [but] not all”). Algarotti was a connoisseur of art and music, well-educated, a friend, and correspondent of most of the leading authors of his time. Wilhelmina, sister of Frederick the Great, called Algarotti “one of the first beaux esprits of the age.” Algarotti's writings include several studies on classical themes and a series of treatises on language (Sopra la necessità di scrivere nella propria lingua, 1750), opera (Saggio sopra l'opera in musica, 1755), architecture (Sopra l'architettura, 1756), Horace, (Sopra Orazio, 1760), painting (Sopra la pittura, 1762). (Sopra l'architettura, 1753), and the opera (Saggio sopra l'opera in musica, 1755). His essays were responsible for introducing the genre of essay-writing into Italy. Among his other works were Poems and Correspondence. Francesco Algarotti’s earliest work, Newtonianesimo per le dame, ovvero Dialoghi sopra la luce e i colori ("Newtonianism for Ladies, Dialogue on Light and Color" 1737), described some of Newton’s experiments on the nature of light and color in the form of a genteel dialogue between a chevalier (cavaliere) and a marchioness (la marchesa di E***). It became very popular and played a significant role in introducing Newton’s ideas to the general public in continental Europe. It was expanded and republished as Dialoghi sopra l'ottica newtoniana (1752). The original book is kept in the Biblioteca Comunale dell'Archiginnasio, Bologna . Viaggi di Russia ("Travels in Russia"), a collection of imaginary letters to Lord Harvey and Scipione Maffei, written between 1739 and 1751, deals primarily with Russian political realities and military campaigns. In the style of eighteenth-century travelogues, it includes many elegant philosophical passages and embellishments, reflecting the combination of "stoicism" and "epicureanism" popular in the intellectual circles that Algarotti frequented, and especially in the court of Fredrick the Great. Algarotti has been criticized for interspersing his account of a journey through the northern seas to Russia with Latin quotations, referring to the classical Mediterranean world. However, the allusions to ancient Rome, playful and serious at the same time, contributed to his evaluation of Russian military power and to his criticism of the Russian campaign of 1736-39 in the Crimea. His chief work on art is the Saggi sopra le belle arti ("Essays on the Fine Arts"). He was one of the main collectors of art for Augustus of Saxony's collection in Dresden. His choice of works reflected the encyclopedic interests of the Neoclassic age; he was uninterested in developing a single unitary stylistic collection, but envisioned a modern museum, a catalogue of styles from across the ages. For contemporary commissions, he wrote up a list for paintings he recommended commissioning, including history paintings from Tiepolo, Pittoni, and Piazzetta; scenes with animals from Castiglione; veduta with ruins from Pannini; and "suggetti graziosi e leggeri" from Balestra, Boucher, and Donato Creti. Kaufman, Sullivan. 1998. Francesco Algarotti the elegant arbiter of enlightenment architecture. London: Sullivan Kaufman. "Francesco Algarotti." The Literary Encyclopedia. This page was last modified on 21 April 2017, at 14:34.